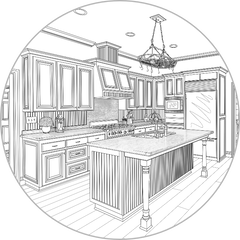 "Full Service Kitchen & Bath Design"
"here we brainstorm all the ideas so you don't have to"
Well appointed cabinetry is the heart of your home's function. It brings warmth and style to your home, and is the foundation of your decor while keeping your home organized and tidy. 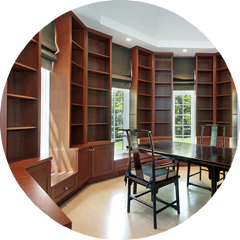 Office, study, dining, or formal, we provide well thought cabinet designs balanced with taste and function. Yes, the kitchen cabinets we're building are first class, but you need a buffet or sideboard cabinet to match?... No problem, we design specialty cabinet pieces and built-in cabinetry. Entertainment systems, bookcases, fireplace surrounds, etc., we can usually accommodate anything. You know something's gotta change, just not sure what? 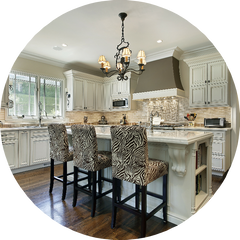 We're professional kitchen and bath remodel designers, we'll help you figure what to change. 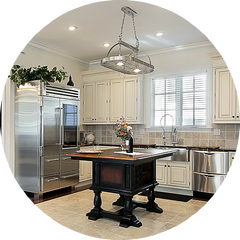 From opening up walls and relocating utilities to appliances and cabinet configuration, we provide exceptional designs that maximize form and function. We draft our ideas into professional building plans ready for local building department review and permits. Our remodel plans clearly spell out the changes including plumbing, electrical, & HVAC, and cover any structural components such as beams & columns. 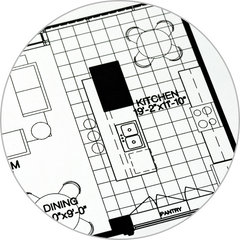 We provide complete kitchen & bath remodel plans. For those who'd prefer professional interior design assistance, we provide it. 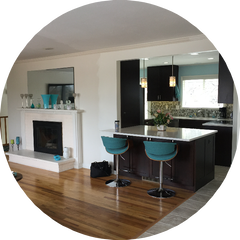 Our interior designers help you coordinate paint colors, lighting & plumbing fixtures, flooring, countertops & backsplashes, hardware, and final decor. Whatever your style, you'll love our interior design experts! Boise's kitchen & bath designers.